Honey is one of nature’s premier superfoods. Not only does honey taste good in tea, yogurt, baked goods etc. but it has been a staple anti-bacterial and anti-inflammatory since ancient times. Even modern practitioners swear by its miraculous healing properties. In the world of medicine, few things can be scarier than bacteria that are resistant to antibiotics, but that’s exactly the problem that modern medicine faces. Over the past fifty years, over-use of anti-bacterial drugs, like Azithromycin, have encouraged harmful bacteria to evolve and become stronger. But there’s no bacterium anywhere that’s resistant to honey! That’s right, honey can kill even antibiotic-resistant bacteria. Ancient people applied it to wounds, infections, and abscesses to great effect. Just make sure you use raw organic honey, which doesn’t include high-fructose corn syrup or white sugar that lower its quality and beneficial effects. In addition to killing bacteria, honey can reduce the severity of coughs and sore throats more safely than over-the-counter medications. This is another example of a traditional remedy that turns out to be more effective than mass-produced drugs by pharmaceutical companies. While adult cough medicines might be dangerous for children to take, raw honey helps lessen the frequency and intensity of a child’s cough, letting parents and kids alike get more sleep during cold season. As if the health benefits of honey weren’t enough on their own. Honey can play another important part in your well-being by sweetening your tea, cookies, pancakes and other baked goods you prepare. Though honey itself is made of fructose, it raises blood sugar far lesser than similar-tasting substances, like sucrose and dextrose. Honey has a healthy Glycemic Index, which means its sugars can be gradually absorbed into the blood stream to result in better digestion. Best of all, you can keep honey on the shelf forever, because it never spoils. Not to put too fine a point on it, but that’s pretty sweet. There’s a lot that honey can do to improve your active life and diet. It’s a great pre-exercise food, for example, because it’ll give you the power you need and you won’t crash in the middle of your training session. 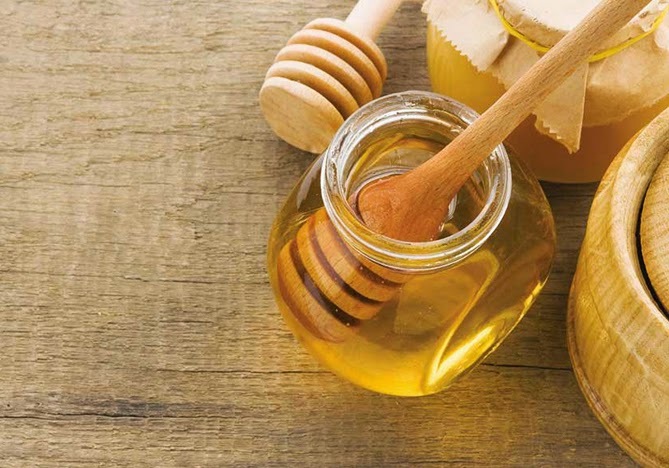 The healing powers of honey don’t just apply to skin wounds – they can help heal painful stomach ulcers, too! Fans of probiotics love honey because it hosts good bacteria, including lactobacilli, which help us digest food. There’s even evidence that honey consumption boosts memory in menopausal women and increase the body’s ability to recover from drunkenness. Old time medical practitioners knew the secrets of honey before science discovered them. Today, there are many good reasons to add this incredible food to your diet!